Are you a WordPress blogger sick of getting spammed by new registrations? 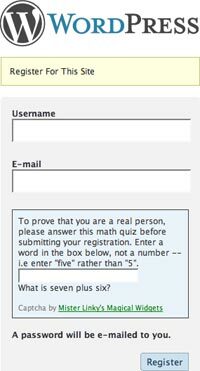 Well I am… or WAS until I updated the Mister Linky Match Captcha Plugin! 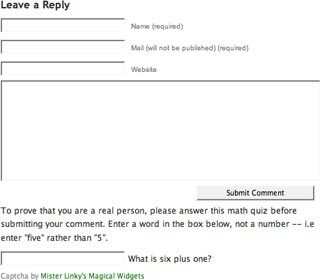 Perhaps you’re not already familiar with this plugin, which uses MATH to thwart bots from filling your blog with comment spam. Instead of having to decipher a hard-to-read graphic (yes, I know that’s the whole idea) you simply respond to a math question. Easy? Yes, easy as pi! ::groan:: Get it? Math? PI? Anyway, I get a bunch of new registrations every week on my personal blog and I finally got sick of it, so I added to the Match Captcha Plugin. Now you can thwart bots trying to register on your blog! This entry was posted on Friday, August 22nd, 2008 at 9:12 am and is filed under Uncategorized. You can follow any responses to this entry through the RSS 2.0 feed. Both comments and pings are currently closed.